Our friends at Vin Bin opened their new store in Hopkinton last month and had the grand opening this past weekend. They had great selection of 40 wines and various cheeses from around the world to sample and of course Grapestorm was there. 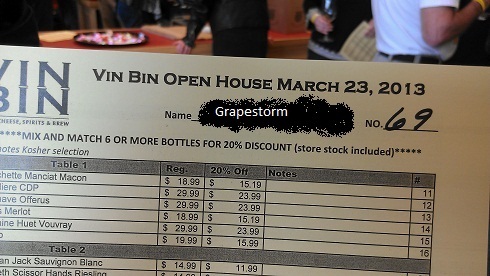 In true Grapestorm fashion we got the best number possible…randomly. The couple in front of us got #68 so we immediately looked at eachother, giggled like small children, and grabbed our glasses. The store was generous and the first 100 groups got a nice Riedel wine glass to taste with and keep. We weren’t the only ones who thought it was funny as every bottle of wine we claimed we got a comment. Some from people you’d expect, others completely out of left field. It’s good to see we aren’t the only wine lovers who enjoy a good immature laugh. The store was packed with over 300 people showing up so we had to do some serious crowd maneuvering but we managed to taste all 40 bottles. They were offering 20% off every bottle in the store so we picked up 12 bottles from the tasting and 2 bottles of 1995 Chateau de Beaucastel Chateauneuf du Pape I found in back. Overall it was a great time and I highly recommend checking out the store if you’re in the area. After 3 hours of wine tasting I thought it would be a good idea to open a bottle when we got home. 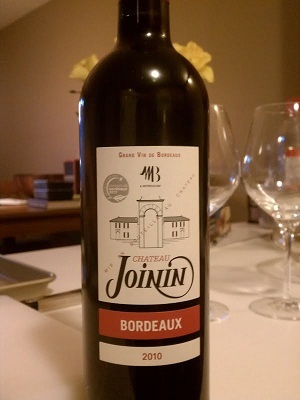 We got mostly whites but we did get a few nice table reds including this 2010 Chateau Joinin Bordeaux. This is a regional wine so it’s a blend of many different Bordeaux grapes but mainly Cabernet Sauvignon, Merlot, and Cabernet Franc and it was very inexpensive at $10. Most young Bordeaux needs plenty of cellar time before it’s approachable but the regional wines are often ready to drink sooner and this 2010 was ready. 2010 was a historic vintage in Bordeaux so it’s no suprise even the table wines are good. Sadly after a long day of wine tasting I don’t remember much else about it other than it was delicious and a good value. So was opening it actually a good idea? Questionable but if you can find some for under $15 pick up a couple bottles to have in the cellar for a casual night. This entry was posted in Bordeaux, France on March 29, 2013 by colonelgrape.